As I sit here this evening (Sunday, three days before this goes live on the blog) and consider a topic for this week’s journal, a dozen of them fly through my head. None of them are, of course, the one I had selected this morning, because I have completely and totally forgotten what it was. I seem to have misfiled it in my highly organized brain. 😉 Anyway, what I settled on was print books. A second reason is that there are readers out there who will not read e-books. I always have sales of my print books, and though they are only a fraction of Kindle book sales, they are steady. On Amazon, I always have the matchbook feature set to free, which means that if a purchaser buys one of my books in print, he or she will get the e-book free. I like to make it that way, because print books are so expensive anymore, that I like to give readers an extra “gift” of sorts as a way to express my thanks for buying my books. 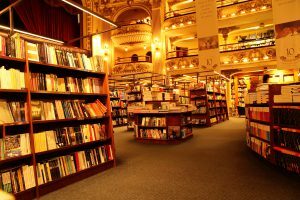 A Bookstore in Buenos Aires, Argentina, South America. Editorial use only! 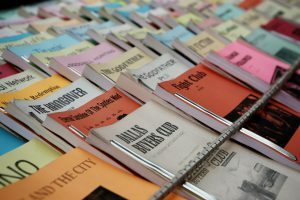 A third reason to publish in print is that it’s never wise, in my opinion, to put all of one’s eggs in one basket. The most successful companies in the world diversify. They offer more than one product. If I wish to be successful, I must also diversify. While print books are perhaps not as popular with a certain group of readers as they used to be, in my opinion, they’re still important. I’ll continue publishing in print for a long time.